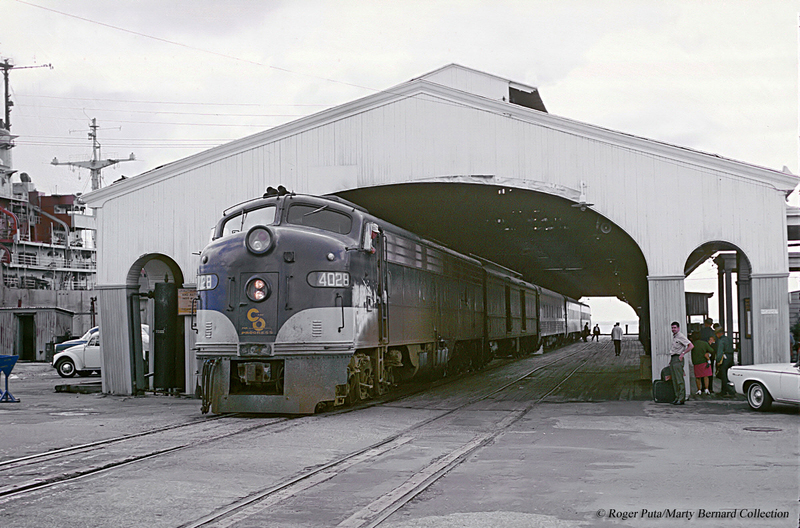 Of all its passenger operations the George Washington was likely the Chesapeake & Ohio Railway’s best-remembered train. The C&O’s passenger fleet can be best described as modest. This reserved approach can best be seen when the railroad would place a huge order of streamlined equipment in the mid-1940s to compete with the best trains across the industry for exemplary passenger service. However, it soon backed out on the plan and with the takeover of the Baltimore & Ohio Railroad in 1962 the C&O began merging its own passenger operations into the B&O’s vast fleet. Today, while the train is no longer used the route it followed is still alive and well under Amtrak known as the Cardinal, although it now extends all of the way to Chicago. The George Washington was inaugurated on April 30, 1932 in conjunction with the real George Washington’s birth, which had occurred 200 years earlier (but not on the same day), operating between Newport News and Cincinnati although sleeper service was offered as far as New York City and St. Louis. The train itself followed the C&O’s super-scenic main line through the Appalachians and the George connected the Newport News/Norfolk area of Virginia in the east with Louisville, Kentucky in the west (at the time, and prior to the railroad’s purchase of the Baltimore & Ohio, one could journey to Chicago via a connection with the New York Central at Cincinnati). To promote the train the Chesapeake & Ohio used the now iconic Chessie, the kitten (which was also used to promote all of the railroad's trains). At one time the C&O had even intended to commission a train named the Chessie the railroad eventually decided against doing such. The creator of the sleeping kitten image was an artist by the name of Guido Grenewald but Chessie is credited to Lionel Probert, who was an assistant to the C&O president. Probert, once he had permission to use the image, added to it “Sleep Like a Kitten” and within just a few years of its debut in 1933 Chessie had earned nearly legendary status! The advertising campaign remains one of the most successful of all time and even today the Chesapeake and Ohio Railway Historical Society continues to sell calendars and other memorabilia featuring Chessie (when the kitten debuted demand was so high that the C&O could not keep enough merchandise in stock). Of course, Chessie’s celebrity status did not end with merchandise and an advertising campaign, the kitten became synonymous with the C&O and she became famous all over again in the early 1970s when the Chessie System, a holding company for the C&O, B&O, and Western Maryland, overlaid the kitten’s silhouette in the Chessie System “C” adorning the railroads new vermilion, yellow, and blue livery. The GW was decorated in the Colonial period, from the era of George Washington himself, and featured all of the latest creature comforts for passengers, such as carpeting and even air-conditioning (at the time of train's commencement only it and the B&O's Capitol Limited included such a feature). 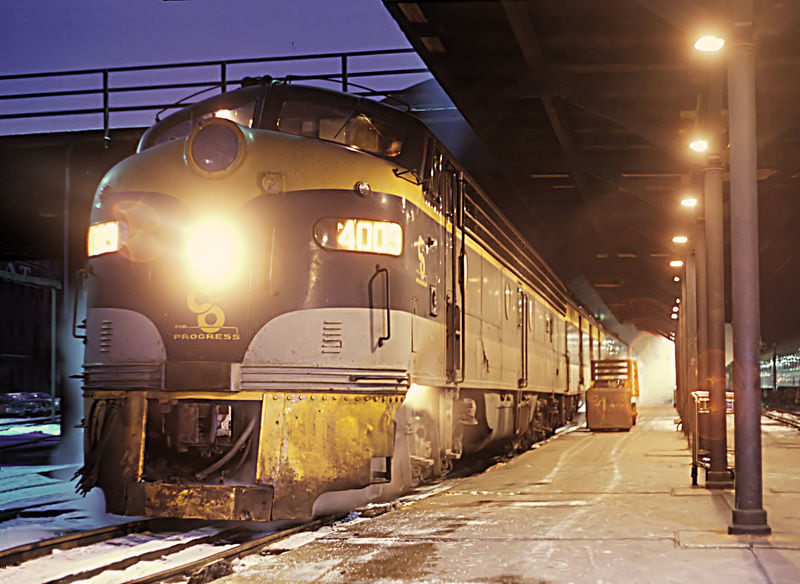 The stateliness of the train, along with its spectacular scenery through western Virginia and the Blue Ridge, West Virginia and the New River George, and portions of Kentucky through Appalachia country quickly propelled it as the C&O’s flagship train surpassing even the railroad’s Fast Flying Virginian, or FFV, its posh operation at the time. Couple this with the fact that the George served a number of elegant and charming hotels, such as its own world-famous Greenbrier Resort, and its no wonder the train became so popular. Listed as trains #1 (westbound) and #2 (eastbound) on the C&O's official timetable the train could reach New York City via the Pennsylvania Railroad and available Pullman/sleeper service or St. Louis via the Baltimore & Ohio. 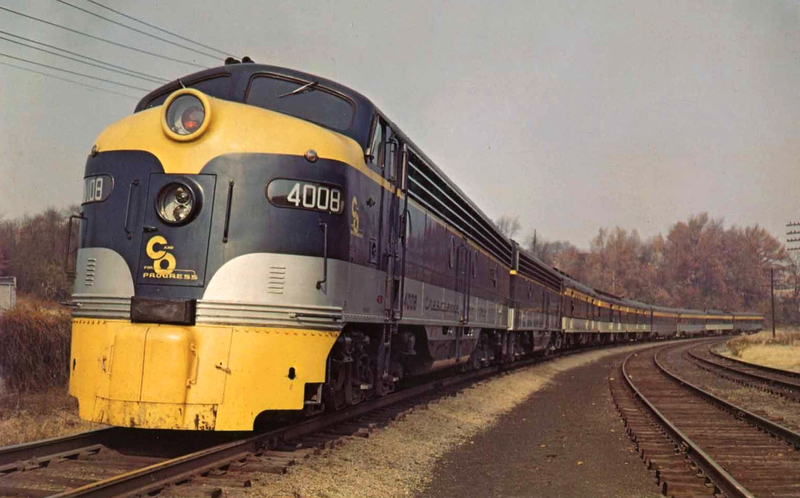 In the early 1950s the train was updated with lightweight, streamlined equipment including matching EMD E-series diesel locomotives, all of which were adorned in a beautiful livery of blue, yellow, and gray (somewhat similar to the B&O’s own passenger livery). The George Washington's consist included Pullman service sleepers, a slumber-room coach, reclining seat coaches, a diner-lounge, and sometimes a coffee shop car. 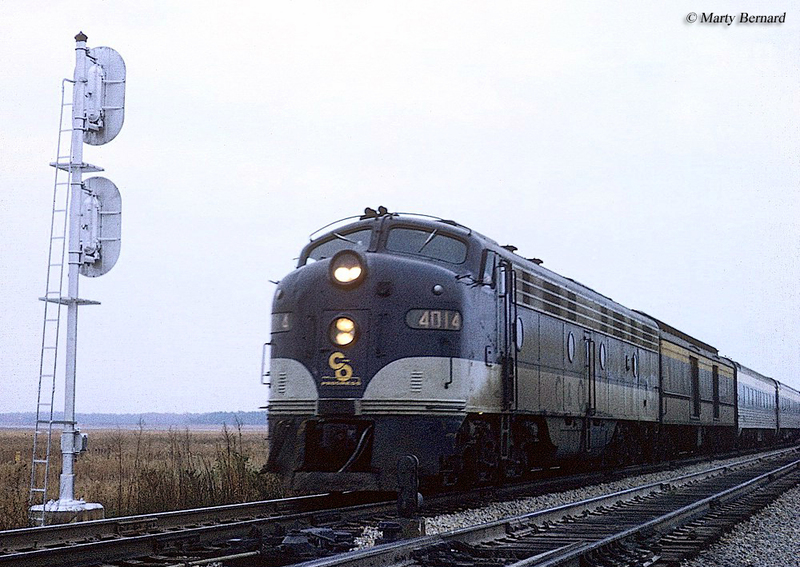 Later, after the Chesapeake & Ohio took control of the B&O in 1962 it combined the B&O’s National Limited, which ran to Chicago, and the George at Cincinnati. The two trains then ran in tandem from there to Chicago and vice-versa as far south as Cincinnati, where they split and continued on their different routings as separate trains. 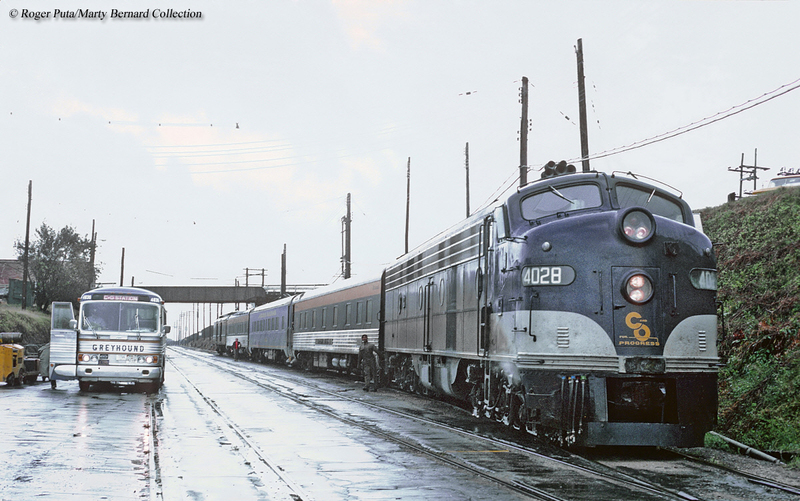 This combination setup between the National and George lasted until the end when Amtrak took over intercity passenger rail operations on May 1, 1971. Today, you can still ride virtually the same route as the original GW under Amtrak’s Cardinal.